So in amongst the usual selection of specials and weird cross-overs Children in Need last night included a preview of the first two minutes of the upcoming Christmas Doctor Who, The Next Doctor. I think perhaps it was a mistake to air the first part of the new series of Doctor Who quite so soon after the last part of Torchwood as it really marks out the differences between the two programmes. After a dire episode of Torchwood we get a great opening to the new series of Doctor Who – and Donna was nowhere near as annoying as I thought she would be either! 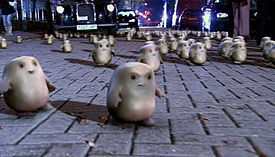 The plot of the first episode, Partners in Crime, revolved around a new alien called the Adipose. Through a front company they are marketing themselves as a miracle diet – except the diet pills are essentially alien eggs that absorb fat from the host species – in this case humans – and as the company adverts say, â€œThe fat just walks awayâ€?. However, it’s not totally foolproof – if the process goes wrong, Adipose can form themselves from any biological matter in the host, reducing them to nothing. At the beginning of the episode, both the Doctor and Donna are separately investigating the company, and through the early part of the episode you get the two characters narrowly missing seeing each other on a couple of occasions, in a sequence reminiscent of numerous comedy routines over the years. Ultimately they spot each other, just at the wrong time, when they are both outside the offices of Miss Foster, the person running the whole operation. All of those sequences work fantastically thanks to having two good actors in the form of David Tennant and Catherine Tate to pull it off. This being a new companion, we also get to meet the family – or in this case re-meet them as her mother appeared in The Runaway Bride, and Bernard Cribbins character from Voyage of the Damned, Wilfred Mott, is Donna’s grandfather. In amongst the action and comedy moments, Donna and her grandfather share a touching moment where Donna confides in him what she is looking for – something she cannot tell her mother. The story is interesting in that it could be argued that there isn’t really a ‘baddie’. The cute little Adipose are quite happily breeding, and in fact are a benefit to their hosts in that they are consuming something the humans want to get rid of – the point where one host totally decomposes is actually caused by Donna herself, who by fiddling with one of the pendants that the Adipose use to mark the hosts that she has stolen, interferes with the breeding process. Indeed the final mass birth is only triggered because the Adipose have been discovered by the Doctor the implication is that had they not been discovered, things would have carried on and nobody would have noticed. This is definitely one of those episodes where you wonder whether the interference of the Doctor was actually for the best. An ethical question to ponder no doubt. All in all it was a great episode with which to kick off the new season, a good crowd pleasing story with a nice mix of comedy and action, and one Rose Tyler shaped mystery to tantalise for the weeks ahead.